James Hutton (1726-1797) made a considerable contribution to our understanding of Earth processes and of the immensity of ‘deep time’. Although trained as a physician, he spent a significant portion of his life as a farmer. He was an outstanding natural philosopher and was elected to the Royal Society of Edinburgh. Hutton was born in Edinburgh on 3rd June 1726. At the age of 14 he went to Edinburgh University to study humanities and medicine. Later he studied chemistry and anatomy in Paris, before obtaining his degree in medicine in 1749 from Leyden in the Netherlands. In 1750, he inherited and worked two farms in the Scottish Borders. He travelled to Norfolk and Flanders to learn new farming methods and employed them on his own lands. 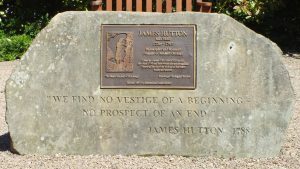 The James Hutton Institute (Scotland’s research institute for land, crops, water and the environment) takes Hutton’s name in recognition of his innovation in agriculture. 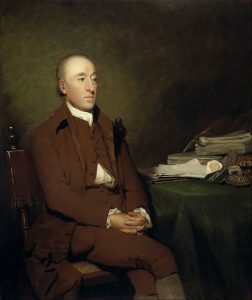 After witnessing first-hand the processes of erosion and sediment deposition on his farms, James Hutton became interested in geology. He returned to Edinburgh in 1767, where he developed and finally published his geological theories. He was an important contributor to the Scottish Enlightenment, a period when Edinburgh, described by Tobias Smollett as “a hotbed of genius”, saw the rise of revolutionary ideas in sciences and humanities. Hutton enjoyed the company of people like Sir James Hall of Dunglass, James Watt, Adam Smith and Joseph Black. Hutton’s Theory of the Earth was presented in 1785 in front of the Royal Society of Edinburgh, then published in 1788 and enlarged to two volumes in 1795. Hutton realised that the processes of erosion, deposition and uplift were connected and operated continuously, driven by the Earth’s internal heat, in a way not previously understood. Field visits to his three famous unconformity sites in North Arran, Jedburgh and Siccar Point took place in 1787-88. All provided evidence in support of his theory. He died on 26th March 1797, and is buried in Greyfriars Kirkyard, Edinburgh (see page 24 of Edinburgh Geologist Issue 63, pdf 3.45Mb). James Hutton is now recognised as the Father of Modern Geology. Download our Lothian and Borders GeoConservation leaflet about James Hutton, which guides you to some of the places associated with him in Edinburgh and the surrounding area. Hutton realised that the processes of erosion, deposition and uplift were connected and operated continuously, driven by the earth’s internal heat, in a way not understood at the time. At Siccar Point in 1788, he finally found the clear evidence he needed to demonstrate his understanding of the processes and cycles that shaped the Earth. Hutton inferred from the sharp junction between the two sets of rocks that an enormous interval of time was required for the underlying strata to be folded and eroded before the overlying sandstones were deposited. The fundamental geological principle of deep time was thus established and Hutton famously concluded his work Theory of the Earth with: “We find no vestige of a beginning – no prospect of an end”. Since then different geological eras have been recognised and dated, and we now know that the Earth is around 4.5 billion years old. Hutton’s discoveries fulfilled a tremendous mission: placing geology in a much wider time frame than the popular belief that the Earth was created in 4004 BC (as calculated by Bishop Ussher in 1650). This enabled geology to become a science in its own right with Hutton as its founding father. This garden marks the exact site of Hutton’s house and garden at the original 3 St John’s Hill, the house where he lived for almost 30 years and where he died on 26th March 1797. The garden was created in 1997. It contains examples of important rock types associated with Hutton’s life. Two boulders showing granitic veins came from Glen Tilt which John Clerk of Eldin visited with James Hutton and illustrate Hutton’s work on the origin of granite from September 1785. The other three boulders are of conglomerate carried by ice and water came from Barbush on the edge of Dunblane. These illustrate Hutton’s understanding of the cyclicity of geological processes. The garden can be accessed from Veiwcraig Gardens off Holyrood Road, take the steps up to the garden from the first bend of the road, near to the Holyrood Road NCP Car Park – Edinburgh EH8 9UL. The Tri-Centenary of Hutton’s birth in 2026. 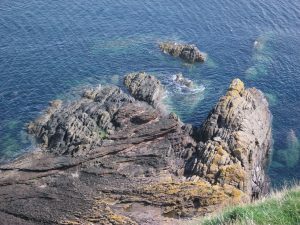 The Edinburgh Geological Society will be marking this occasion by holding a series of events.